I have spent much of today trying to frantically catch up on the housework and the ironing. I am not one of those housewives who loves housework. In fact, I am not sure many of those exist these days. I’m a big appliance user, and the washer, dishwasher, Roomba (robotic vacuum) and Scooba (robotic floor washer) were all on the go today. That is my Scooba above. 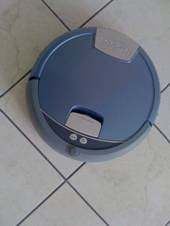 My Roomba looks much the same, except he is silver. I have talked about them in my blog before - on January 21st - in my entry entitled Space Age Housewifery. But it is not just when it comes to housework that I like to use appliances and gadgets. I use them in the kitchen as well. I would not be without my wonderful electric mixer, my food processor or my bread maker. But I also like the slightly smaller, more eclectic time savers you can buy to help with cooking. For example, I love this little pastry brush my Dad gave me years ago. It’s made of a heat resistant material so you can use it on hot things as well as pastry. Plus you can wash it in the dishwasher. I also have a spatula made of the same material. It’s wonderful. 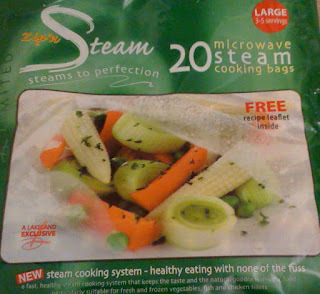 One of the best things I have found recently that helps in the kitchen are the amazing steamer bags shown below. They come in a medium and a large size and you can steam just about anything in them using the microwave - even fish! What I use them most for is steaming small quantities of vegetables, like the asparagus in this week’s Recipe of the Week - Asparagus and Scallop Pesto Tagliatelle. I get mine from Lakeland. They have several stores, but the nearest one to me is Oxford so I order online at www.lakeland.co.uk . Their service and delivery have always been great for me. I’m always on the lookout for new and different gadgets to help make life easier and save time. So if you find any, do let me know!